ride report: sean, ed, mike, tivo HD kit guy (sorry didn't catch your handle), and yours truly met in the predawn blackness at ritual and, donning rain capes, set out to conquer the elements. unexpectedly, an unknown rider emerged from the gloom of cortland and joined our skulking retinue; fearing the presence of a highlighter-toned wraith, I timidly inquired of the apparition what manner of spirit it was, but instead of inflicting greivous wounds upon me, the answer came a cheerful "Hi, I'm Ruth from Stanford!" This good witch of the Castro summoned another rider on the unlit, rainswept corner of Paul/San Bruno, who turned out to be another Stanfordian wisely mounted on a 'cross bike, and whose name was something exotic, perhaps of the Steppes of the Caucasus, starting with an S.
sheets of rain and mighty unabating headwinds assaulted us relentlessly, but we carried on in grim defiance, unmoved. the 'cross section was particularly noteworthy today, as it received just enough rain to form a new type of supergoopy gluelike substance, which resisted all streams and jets of water from the hose following the bridge to nowhere. Recommendation: bring the 'cross bike w/ knobbies next time, as traction is limited. 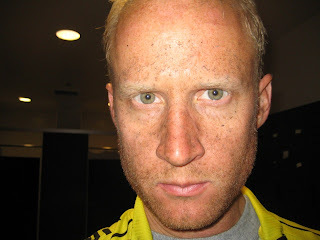 So I meant to write something up about Fridays ride or really crash. Anyhow the carnage all happened on the final right turn on Haven Ave.
in Menlo Park, just before the Bayfront Expressway/Marsh Rd. Eric rolled up right after that. Yuko pretty quickly figured out she was in bad shape. you probably don't want to click that. Half Moon Bayway was a magnificent way to finish the challenge. Can we do the week all over again?!?! I never thought I'd say that. And thanks for the lunch at Google! My ride ended with a flat - but not until I got back to my office. I believe the route originated w/Salim, prior to his Google employment...mapped originally as the "Krispy Kreme Run" when the only location around was the first store in Mt. View. We rode it once and consumed/inhaled 2 dozen doughnuts in about 5 minutes. Then we tool Caltrain home, post sugar-high.